Ben Novak, now 27, vowed to devote his life to resurrecting the extinct species of Passenger Pigeons at the age of 13. The last known of its species died in captivity in 1914. 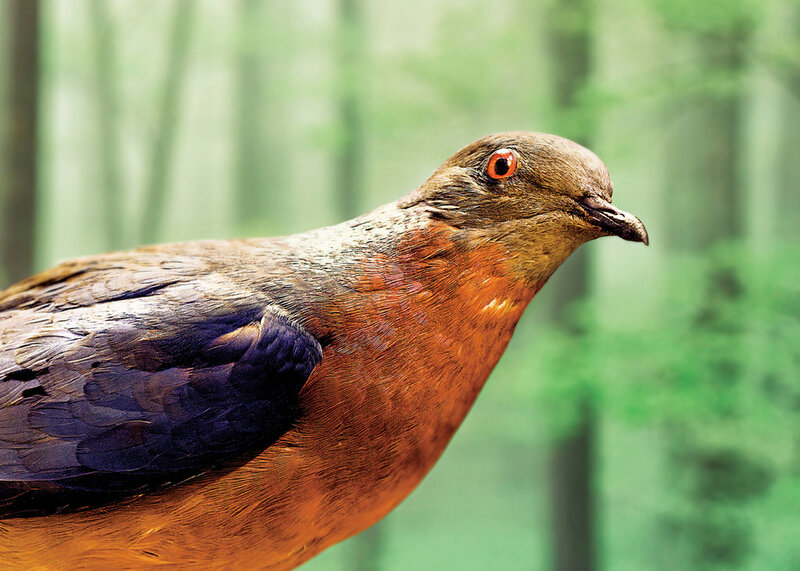 Novak and other researchers at the University of California, Santa Cruz are working to resurrect the extinct species of pigeon in what they call “The Great Passenger Pigeon Comeback” project. The project is essentially attempting to create a facsimile of the bird. “This was the most abundant bird in the world. It was thought that one out of four, maybe one of three birds in North America in the early 19th century was a passenger pigeon. It really did blacken the sky for days,” said Stewart Brand, one of the lead researchers on the project, in an interview with Neal Conan of NPR. The project, Revive and Restore, focuses on bringing back extinct animals to undo harm done by humans, restore ecosystems and advance science, according to longnow.org. The Revive and Restore foundation centralizes on using Harvard molecular biologist George Church’s genome-editing technology to bring the species back to life. The technology is being used to edit the DNA of living pigeons to resemble that of Passenger Pigeons. “By comparing the fragments of Passenger Pigeon DNA with the genomes of similar species, researchers can assemble an approximation of an actual passenger pigeon genome,” according to Nathaniel Rich of The New York Times. Researchers are currently working on finishing up the writing of the 1.2 billion letter Passenger Pigeon genome. The next step will be to inscribe the approximated DNA onto a living cell. The research team will grow a band-tailed pigeon cell, a species closest to that of a passenger pigeon, and then take out the pieces that differ from the passenger species and replace it with synthesized passenger pigeon DNA. The cell will then be placed into a band-tailed pigeon embryo and if the gestation is successful, band-tailed looking pigeon chicks with Passenger Pigeon internal characteristics, or “chimeras,” will be bred. This crossbreed will then be bred with one another in hopes to produce passenger pigeon chicks. Novak hopes to hatch his first Passenger Pigeon chick in the year 2025, according to The New York Times. The topic of “de-extinction” does not go without controversy. CSUSB Vertebrate Paleontology Biologist, Dr. Stuart Sumida, believes the expected products of this experiment will not be exact replicas of original Passenger Pigeons. “Even if they all worked, it would still be a hybrid, as the mitochondria of cells also contain distinct DNA, and that would necessarily come from the surrogate/mother (band-tailed pigeon embryo),” added Sumida. Student Kelly Pearson voiced her concerns of the Revive and Restore’s “de-extinction” process. “We have all seen Jurassic Park. We all know how it ends. Right? Badly,” said Pearson. The project hopes to be a jumping off point for other possible resurrections such as the Dodo bird and the Woolly Mammoth in the future, with the focus of science at the helm. “The most interesting part of all this is going to be where the science goes, what we learn from doing this. It’s not going to be necessarily about bringing back something. It’s going to be about what we learn,” said Ryan Phelan, Executive Director of Revive and Restore.